Saturday's record heat produced the eruption of more wildfires in Colorado and provided fuel and aggressive growth conditions for the fires already burning in the state. 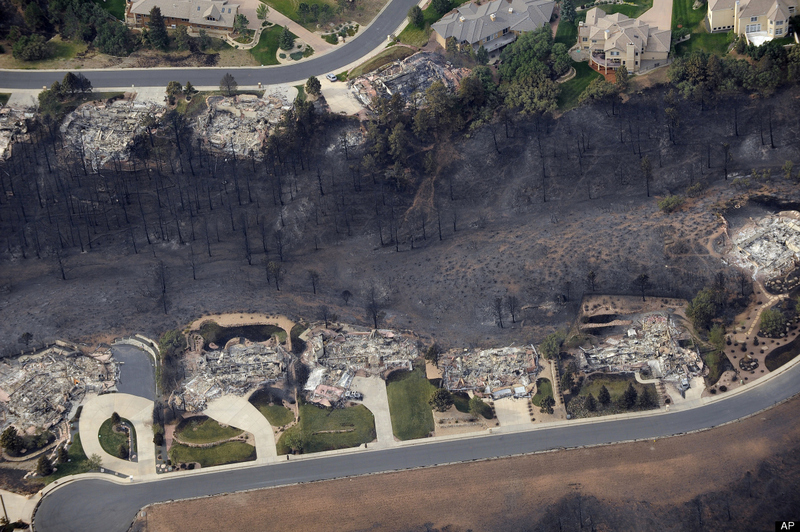 There are a total of eight major fires burning in Colorado as of Sunday morning. Relative humidity levels were near zero on Saturday, temperatures soared to triple digits. Firefighters use a scale to measure the conditions for growth potential -- called the "Haines Index," a scale of 1 to 6 with 6 being the worst -- Saturday was a "super 6" and Sunday is expected to be the same. High Park Fire: The largest of the Colorado fires currently burning is now the second largest fire in state history as well as the most destructive. As of Saturday night, the fire has burned more than 81,000 acres. Waldo Canyon Fire: Burning west of Colorado Springs, the Waldo Fire has burned 2,000 acres as of Sunday morning. The entire city of Manitou Springs has been evacuated because of the fire burning in nearby Pike National Forest. Evacuations began at 1 a.m. Sunday morning. It remains 0 percent contained. Woodland Heights Fire: Burning in Estes Park, the Woodland Heights Fire has burned around 20 acres and at least 21 homes have been burned. According to fire officials, no one has been injured. Treasure Fire: Burning near Leadville, Treasure fire began burning on Saturday afternoon. 20 acres have been burned near Fremont Pass, Leadville and Copper Mountain Resort. Springer Fire: Located 3 miles from Lake George, Springer Fire is burning on the Pike National Forest and is estimated at 1145 acres. No structures have burned and there have been two minor injuries. Little Sand Fire: Burning 13 miles northwest of Pagosa Springs, Little Sand Fire was started by lightning on May 13 and has now burned 18,439 acres. It is 34 percent contained. Stateline Fire: Burning near Durango, the Stateline fire had grown to approximately 80 acres on Saturday. Weber Fire: Burning near Mancos, the fire is estimated to be burning 7,500 acres on Sunday -- tripling in size overnight. Evacuations were ordered for Elk Springs and Elk Stream Ranch subdivisions.